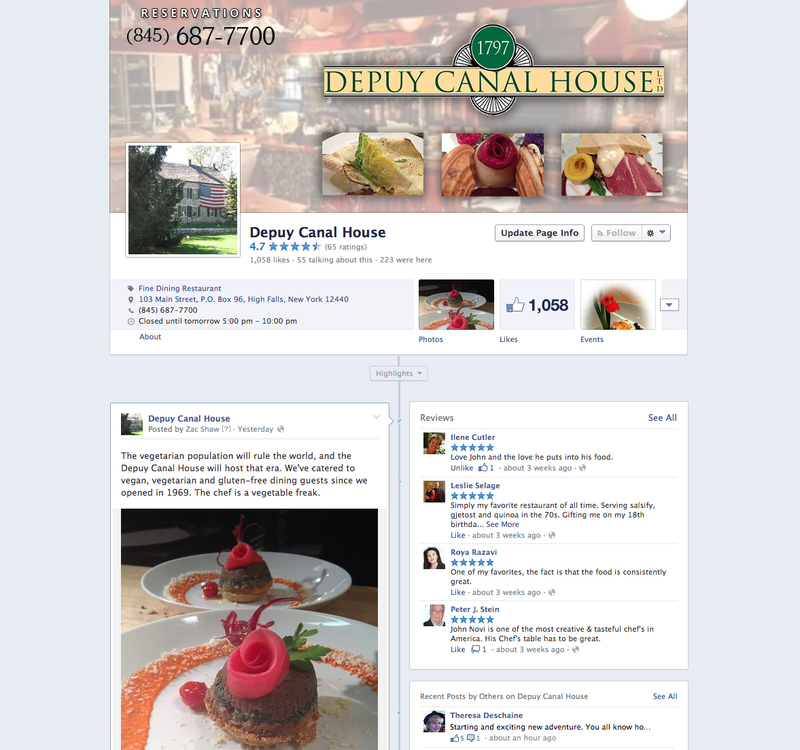 The Depuy Canal House is run by owner/chef John Novi in an historic building in High Falls, NY. Novi is one of the “original celebrity chefs” of the 70s and 80s, and is a household name in artful cuisine. In early 2014, after a temporary seasonal closing stretched on for over a year, Depuy Canal House was struggling to reconnect with their customer base. With a shoestring marketing budget and a Facebook-centric strategy, we were able to turn the whole business around in a matter of weeks. By applying social media best practices, generating high-quality post content, and strategically targeting local area residents, the Depuy Canal House page went from around 700 to over 1000 high-quality “likes” in less than a month. Engagement shot through the roof, with Novi’s loyal fanbase coming out of the woodwork to sing his praises with hundreds of comments, reviews and re-shares. We continue to maintain Depuy Canal House’s Facebook page and assist the chef with the content production, site maintenance and integrated marketing that goes along with that responsibility. At the end of the day, sold-out seatings and a 1000% increase in reservations proved our strategy was and continues to be a great return on investment.